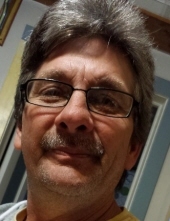 Michael John Jacobsen, age 54, passed away on Sunday December 2, 2018 at the Clarissa C. Cook Hospice House in Bettendorf. A Celebration of Life will be held at Steffens’ Tap in Calamus on Thursday December 6 from 4-7 p.m.
Michael was born November 18, 1964 to Glen and Georgia Boyd Jacobsen in Clinton, Iowa. He was united in marriage to Dana Baxter on September 20, 1996 at Las Vegas. She passed away on May 12, 2014. Survivors include son, Jacob of Calamus; step daughter, Nicole of Calamus; sister in law, Darla of Wheatland; nieces, Kassidy and Sammie; nephews, Jeff (Charity), Jason, and Chris (Becca); brother Glenn; brother in law, Keith Griebel, and in laws Janyce (Jim) Stroyan of Davenport. He was preceded in death by his parents; sister Debra, and his wife. Michael enjoyed boating, camping, and his meat smoking competitions. His family meant the world to him and he enjoyed meeting and talking to new people. He liked to play his music loud and shooting off his fireworks on the 4th of July. Michael will be remembered for his famous line “let the festivities begin!”. To plant a tree in memory of Michael John Jacobsen, please visit our Tribute Store. "Email Address" would like to share the life celebration of Michael John Jacobsen. Click on the "link" to go to share a favorite memory or leave a condolence message for the family.